Sergeant Charles Irvin Miller was born on March 2, 1946 in Grand Rapids, Michigan to Mr. and Mrs. Robert V. Miller of Ann Arbor, Michigan. Charles is a 1964 graduate of Ann Arbor High School. 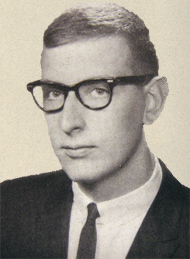 He attended the University of Michigan and Eastern Michigan University before enlisting in the Army in March of 1966. He received his Basic Training at Fort Knox, Kentucky, and Advanced Training at Fort Hood, Texas. Sergeant Miller began his tour in Quang Nam Province, South Vietnam on October 6, 1967 serving as a Military Policeman with MP Platoon, Headquarters, Headquarters Company, 198th Infantry Brigade, Americal Division. Charles was killed by an explosive device on May 13, 1968. He was posthumously promoted to Sergeant and awarded the Bronze Star Medal, Good Conduct Medal, and Purple Heart. According to the Bronze Star Medal Citation, "He was quick to grasp the implications of new problems with which he was faced as a result of the ever changing situations inherent in a counterinsurgency operation. His initiative, zeal, sound judgment and devotion to duty have been in the highest tradition of the U.S. Army." Charles Irvin Miller is survived by his parents and two sisters. He lived 22 years, 2 months and 11 days. He is resting in Bethlehem Cemetery in Ann Arbor, Michigan. Charles' name is listed on the Vietnam Memorial in Ypsilanti Township under Ann Arbor. His name also appears on the Vietnam Memorial in Washington, DC on Panel 59E Line 029. Chuck was a hero. Believe me when I say that the limited comments here-to-fore are not due to friends and family not wanting to bother. As younger male cousins, my brothers and I would pester him and receive kindness in return. As an older male cousin, Chuck would actually spend time with us when I'm sure he'd rather do something else. I remember well reading comic books together in Uncle Bob and Aunt Harriet's basement and playing silly board games. I liked to think that when we visited, which was not often enough, that I was his kid brother. Chuck was a hero long before he donned a uniform. He was a truly great American role model. He is missed by many. Although my Uncle Chuck died tragically before I had the privilege and honor of knowing him, his memory was and continues to be strongly felt in my family. My Mother's family was small, and Uncle Chuck was the heart of it. There is not much family left to share memories. Although I never knew him I mourn his loss. Thank you to all who take the time to share on this website. It gives me a little more information about a man I can only wish I had been able to meet. A cousin of Chuck's, but just a little older, I reported to Vietnam a couple months after he was killed. I was fortunate to learn just a few details of Chuck's last convoy. He was at the front as usual, as he insisted. That made me - and I'm sure the rest of our clan - proud of his style. He was proud of his job, his family, and his country. I didn't know him well growing up. We lived 100 miles apart - a prohibitive distance in the '40s and '50s - but did know him, and remember his often! I never knew Uncle Chuck as he died before I was born, but his absence in my family growing up was strongly felt. He left a profound mark on those whose lives he touched...even indirectly. My 'little' brother will always be missed. Charlie was my younger brother and one of my best friends. At home we called him 'Chuck.' He was my only brother and my parents' only son, and he was my son's Godfather. The list of positive adjectives describing this fine person cannot be long enough. His family loved him more than words can say, and my sister and I still mourn for him even knowing he is in Heaven. His body was laid to rest in Ann Arbor, MI, and he was later joined by his parents and brother-in-law. I am happy to see memories of Chuck and will look at this page often. Thank you to all of you who care.